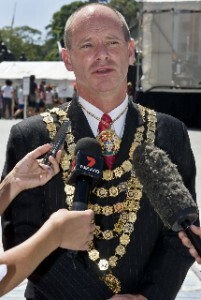 Brisbane’s lord mayor has defended expenditure of almost $4000 for renewal of his chains of office. Responding to Opposition claims at yesterday’s Council meeting that thousands of dollars had been spent cleaning the chains – worn by lord mayors at official ceremonies – Cr Graham Quirk said most of the cost was for making and adding a new medallion commemorating his predecessor, Campbell Newman. Whenever a mayor leaves office, a medallion is added to the chain recording details of the retiring mayor. “Three-quarters of the cost was the manufacturing of the medallion,” Cr Quirk said. Cr Quirk said he hadn’t known of the work or its cost. But he defended the commemorative chain links of each past mayor of Brisbane, which are kept in a council safe and worn by the mayor on official occasions. Labor mayoral candidate Ray Smith issued a press release to say it was an appalling and inexcusable waste of ratepayers’ money. “Wasting $4,000 to have some chains polished is a blatant example that this lord mayor has the wrong priorities for our city,” Mr Smith said.